Keeps beverages hot for up to 12 hours and cold for up to 24 hours, The insulated water bottle is a great gift for any occasion. The water bottle is double-walled and made from high quality food grade 18/8 stainless steel that will maximize strength and integrity. The exterior of the vacuum sealed area is dipped in copper for added insulation. Copper reduces the transfer of temperature. the Spout Lid is perfect for the beach, camping, the Flip Lid fit for office and hiking. 1.Do not put the lid in Oven, Microwave, Fridge or dishwasher to avoid damage. 2. Before first use wash with detergent to completely clean the products, then rinse and dry. lining before use to avoid leakage. 4.It comes with two separate straws that can be cut to fit your wide mouth Water Bottles. 5.Please do NOT store sugary drinks in the water bottle for more than 24 hours. Please do not over-tighten the lid and do not force it open. The water bottle is double-walled and made from high quality food grade 18/8 stainless steel that will not break. The exterior of the vacuum sealed area is dipped in copper for added insulation. Copper reduces the transfer of temperature, adding even more insulation to your bottle. This Growler Won't Leak. lid with handle for easy carrying. While sitting anywhere in any temperature condition, your cold drink will stay perfectly chilled up to 24 hours or your coffee or tea will keep hot for up to 12 hours. Beer growler 64oz (1/2 gallon) carries over 5 bottles of beer; if use it like water bottles (insulated) - this volume is enough for your daily hydration. Choose between the most popular and durable powder coated colors on the market, The Powder Coat works with the premium insulation, which prevents condensation from forming on the outside of the bottle, to give you exactly what you want in an everyday refreshment delivery system. 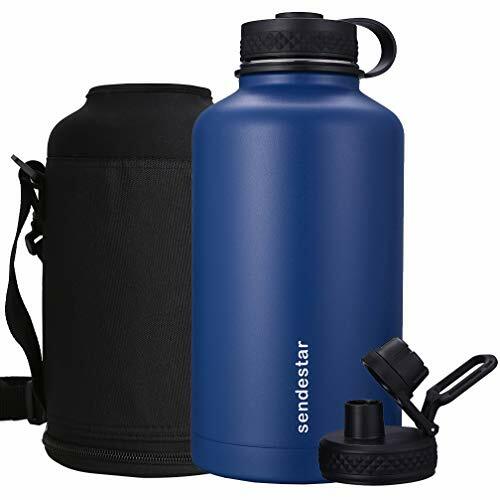 What You Get: 1 X Sendestar 64 oz Water Bottle,1 X Spout Lid,1 X Flat Cap, 1 X Water bottle Pouch, warranty and friendly customer service. If you have any questions about this product by Sendestar, contact us by completing and submitting the form below. If you are looking for a specif part number, please include it with your message.